Recently, I got to dine in a shiny new Mexican eatery called Luna Blanca Taqueria. It’s only been open for a couple weeks, and normally I’d give a new place additional time to simmer before reviewing it. But the food and service has been dialed in since the day the doors opened. So, why wait? I’m always eager to share good food news. Luna Blanca Taqueria is the creation of Mikel Trapp and Bret Johnson, who have been on the Utah food scene for a long time. Johnson, most recently, was the food & beverage director at Snowbird Resort; Trapp, who has also held the position of Snowbird’s food & beverage director, owns Fresco Italian Cafe and Café Trio and previously worked as executive chef at Stein Eriksen Lodge and Metropolitan. So, there’s no shortage of culinary brainpower and skill or restaurant-business acumen at Luna Blanca, and it’s not surprising that Trapp and Johnson positioned their new eatery conveniently for hikers, skiers and such enjoying the Cottonwood canyons. Located adjacent to the new Hyatt Hotel just off Interstate 215 in Holladay, Luna Blanca is a casual, modern-looking eatery with a Chipotle-like vibe to it. But it offers at least a few things that Chipotle doesn’t: table service, patio dining and booze, for example. Oh, and the food at Luna Blanca is made from scratch; nothing comes from a can. As one of the owners told me, “We don’t even have a can opener in the kitchen.” High-quality ingredients like Niman Ranch meats mean a slightly higher price tag for meals than you might find at your local taco cart. But then again, does your favorite cart sell 15 different tequilas, or housemade sodas and chaparritas? There is also a significant beer, liquor, wine and cocktail selection. In fact, the bar menu is actually longer than the food menu. Opting for a “less-is-more” approach, the Luna Blanca menu consists of a handful of appetizers, a soup of the day, a couple salads, three quesadillas, a selection of tacos and burritos, side dishes and desserts. With a manageable menu like that, every item (that I have tried, anyway) has been thoroughly taste-tested, and is totally spot-on. There wasn’t a single dish at Luna Blanca that I wouldn’t happily eat again and again. Corn chips (fried in-house) with salsa ($3) are a no-brainer to kick off a meal. However, I highly recommend also ordering a generous bowl of bean dip ($7). I’ve never had better dip: creamy pinto beans, morsels of cinnamon-scented carnitas pork, caramelized onions and roasted pasilla peppers, topped with jack cheese and broiled until just slightly charred on top. It’s a beautiful thing, something I don’t think I’ve ever said about bean dip. Al pastor is a house specialty, and the taco al pastor is delicious: a freshly made corn tortilla topped simply with chile-braised pork morsels, roasted pineapple pieces and cilantro (they’ll hold the cilantro if, like me, you disdain it). 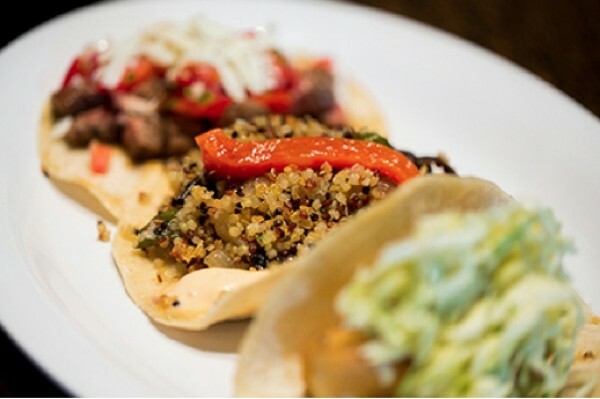 There’s also an interesting vegetarian mushroom taco made with grilled portobello, quinoa, roasted peppers, onions and chipotle cream. Luna Blanca offers a similar roasted mushroom quesadilla ($6), too, which includes Mexican cheeses and guacamole. The fish and shrimp tacos are excellent, but the best in my book is the slow-roasted carnitas taco, with crisp pork, pickled onions and (optional) cilantro. Generally speaking, Luna Blanca prices are quite reasonable. However, I’m a little concerned that some customers will be surprised to find that tacos, priced from $3 to $3.75, are one per order. Sticker shock might especially occur when someone orders a couple of street-size tacos for, say, $7, and the person next to them gets a burrito the size of his forearm for $8. If the tacos are a tad pricey, the burritos are a bodacious bang-for-the-buck. Super-size flour tortillas are stuffed with Mexican rice, a choice of vegetarian black beans or pinto beans, shredded lettuce, cheese and house crema. I ordered the pork burrito ($8), made with locally sourced braised pork, smothered with green chile sauce ($1.50), and could only manage to eat half of it in one sitting. The second half made for a delicious lunch the next day. Servers at Luna Blanca tend to be young and without the experience you’d find at, for instance, Fresco. But they are very friendly, well-trained and enthusiastic. A server of ours, who was understandably unfamiliar with the bottle of wine we’d ordered (Torrontés, from Argentina), went out of his way to research the vino and returned to our table with copious notes. Next time, he’ll be able to tell his customers all about Torrontes. In an era when too many restaurants are staffed with slackers, it’s refreshing to see that kind of motivation. But back to the food. Nothing says summer like grabbing a sunny spot on the Luna Blanca patio, ordering a cold cerveza or margarita, and enjoying a crisp, cool salad. There’s a chopped salad and a spicy Caesar salad, and each comes in full- or half-size portions. The Caesar salad ($4/$8) is really good: a crispy, fried tortilla serves as the base, topped with chopped Romaine lettuce, housemade croutons, Mexican cotija cheese and a delectably creamy roasted-red-pepper dressing. The chopped salad ($5/$9) is Romaine, baby kale, black beans, tomato, charred corn, cucumber, pumpkin seeds and avocado in a superb green-chile & buttermilk dressing. By the way, whatever you select at Luna Blanca, be sure to order at least one corn on the cob ($3). It’s heaven for corn lovers: nicely charred and bathed in sweet and tangy chipotle butter and queso fresco. What else can I say? Enjoy Luna Blanca’s freshly fried churros with Mexican chocolate dipping sauce and/or the housemade popsicles for dessert, and you’ll be shouting olé!